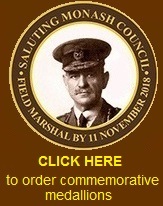 The important symbolic action of promoting General Sir John Monash is also a symbolic honour for all members of the AIF in particular the over 60,000 who did not return and their families. His action shortened the war when you consider that the British command were planning that the war might continue to 1919. His new methods of combining all forces from use of tanks and the air force were all designed to win the battles, more importantly save the lives of his soldiers.